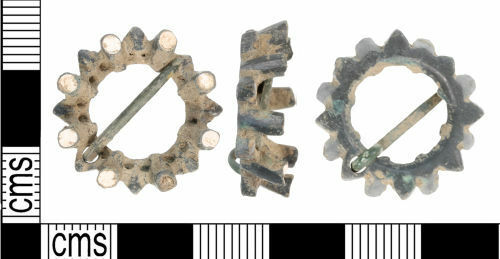 A complete Medieval annular copper alloy brooch, probably dating to between c. 1250-1400 AD. The brooch consists of a eight-pointed star design, with eight cyclindrical projections protruding from between the points of the star; each projection extends outwards at an angle and has a white enamel top. Each point of the star has two decorative sub-circular hollows on the interior, apart from the pin, which is attached through a circiular perforation on one of the star points. The pin is made of copper alloy wire and is D-shaped in cross-section and it moves freely. The reverse of the brooch is plain and flat. It measures 22.6 mm in length, 21.9 mm wide, 6.7 mm thick and weighs 4.3 g.
Similar to PAS records GLO-B77A8A.